It is accessible via browser with same account and password. most likely your problem is related to your proxy settings. 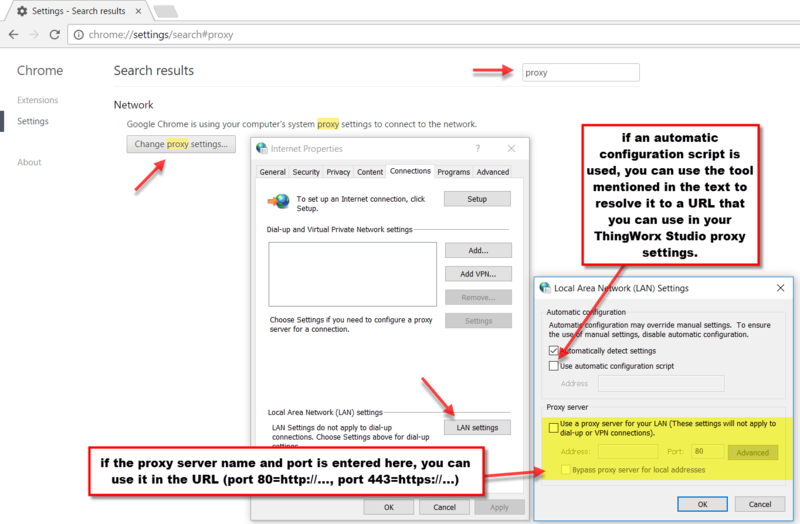 The URL that you entered for the proxy server is the same as the Thingworx Experience service URL. Instead you'll have to enter the URL of the proxy server that your company configured, most likely an in-house server. If a config script is used, follow this document to get the resolved URL of your proxy server. Download this tool to verify the results are as follows, did not solve the problem of publishing. I put the agent emptied, click on the release with the results before the same, I ask whether this issue is related to network speed? As the server abroad, through the Chinese network and the increase in the number of users, leading to the current Chinese users if the network is not very good, will be published failure? Jiali Guo​ Most probably your network has restricted access, that might be the reason why the ProxyTester tool didn't work. Can you try publishing the experience from a NON-Corporate network or a Public Network? I have tried to publish from a non-corporate network or public network, the same problem occurs, the above release error is released through the public network. I was having an similar issue, although not through a proxy server, however despite having that "Local Host" warning dialog box appearing stating that the Publishing was unsuccessful, I went ahead regardless and viewed the ThingMark I had assigned for the various projects I had tried to publish and I found that, despite the warning messages, the projects did actually publish perfectly well! I am still getting that warning dialog box with every project I publish, but I simply ignore it! My projects still publish OK! Have you gone ahead and just try to see if you can scan in the associated ThingMark to see if your project has published? Perhaps you will find it has Jiali Guo? In the Studio Project panel, when you navigate to Configuration section's Info tab and execute the 'Validate' button (next to ThingWorx Experience Service field) does it prompt error? I mean after providing your credentials. Yes, technically the proxy server shouldn't be the URL of the Experience Service, for the correct proxy I would strongly recommend either contact your IT team or follow the procedure laid out by Moritz. Now that without proxy, the validation is successful. From here on you can skip the proxy part. Coming to pop-up error, please verify your username and password, make sure you are using the credentials provided in the "welcome email" (not the ones you've created). Also try clearing browsing cache and give it a try. Will this issue with the account permissions is related? Can I provide you with a password,Do you help verify it? The browser cache has tried to clean up many times, and the problem still occurs. The user is using the credentials provided in the "welcome email".